So.... it's been a long time since I've posted anything. Well let's jump right in! I have decided to start a Wednesday WIP. Every Wednesday I will be sharing my current WIPs (Work In Progress). I've never been good at keeping up with a posting schedule but I think it'll benefit me in the long run. This summer has been filled with crazy changes that have caused me some major stress and panic attacks. I'm talking full on panic. The kind of panic that I would imagine a prisoner walking to the guillotine would have. Looking back over the crazy stressful events, my husband pointed out something to me- over the last couple of months he's noticed I haven't been working on my knitting. No knitting. No crocheting. No embroidery. I was denying myself all the things that keep me happy. He was totally right. My crafts keep me sane! They help calm me down when I'm stressed. I wasn't allowing myself to have any time to decompress and unwind. Crafting is my therapy. There are numerous scientific studies out there that prove it. Everyone!! Keep that crafting going! The world could be a safer, better, happier place! So, picking those needles and hooks back up, here is my first WIP in the project pile. This blanket of sunshine is pure HAPPY!! 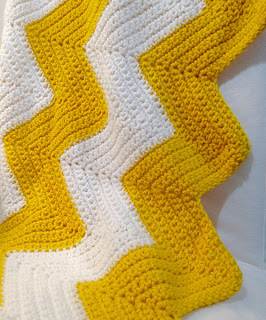 I'm using the pattern Chevron Baby Blanket from the very cool blog Eat, Knit & DIY. Krista fills in the the bottom and top zig zags to make a straight edge but I happen to like the points that it naturally makes so I'm leaving them as is. I'm also making this blanket big enough to fit a full size bed. More to cuddle! 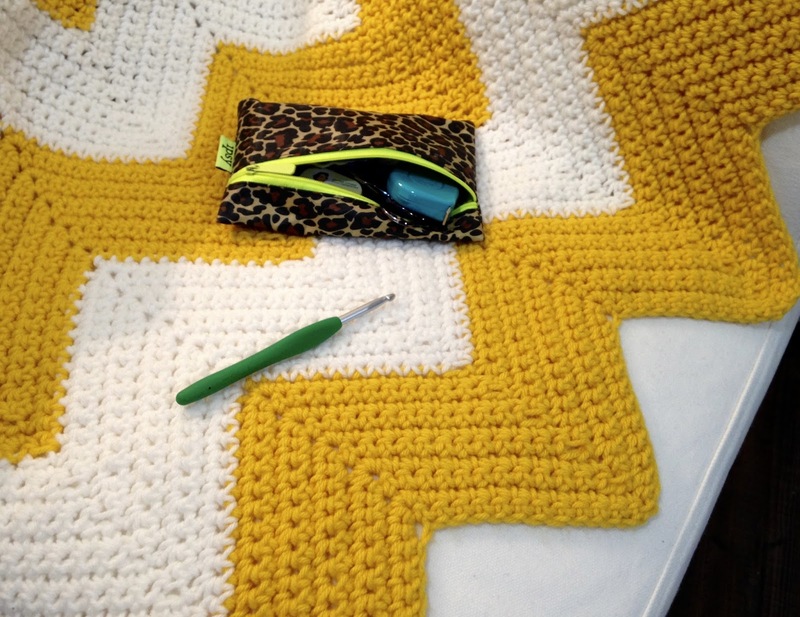 I have to admit, I am not a very experienced crocheter. I learned the most basic of basics from my grandmother when I was very very young but I've only recently been diving into it with seriousness. 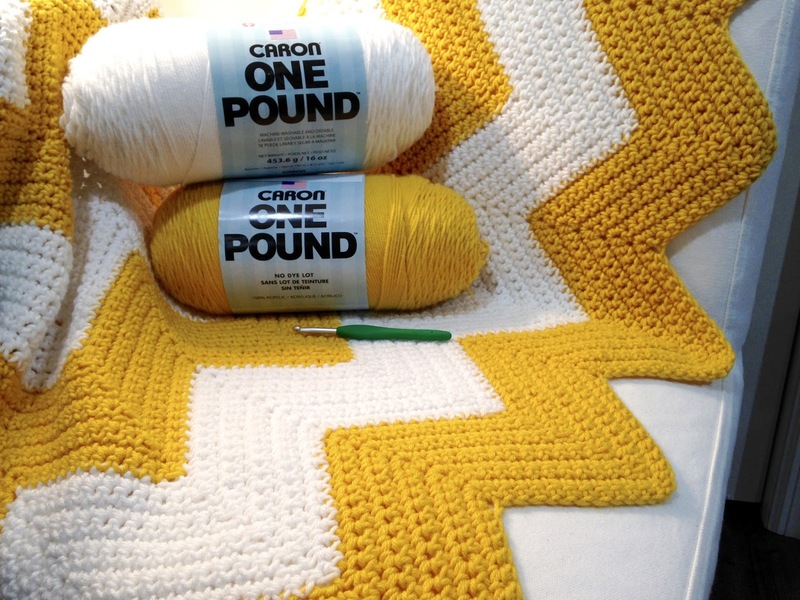 This, in my opinion, is a great beginners blanket. Easy repeats. Easy to stitch while watching TV. I'm using Caron One Pound acrylic worsted yarn. I'm not a huge fan of acrylic but considering how much this sucker is going to get washed, it seems like that best choice. This particular yarn is a little scratchy but it does soften up after a wash. With lots of fabric softener. I'm using the colors white and sunflower. Doesn't it just instantly make you smile? Sunshine. That's what i want to see laying on my couch when I come home from a long day at work. Pure happiness in the form of blanket. Those colors together really are great! And I really like the chevron stripes of the blanket. Thanks! I was never a big fan of yellow but it just called out to me. Now I'm hooked. It's just so cheery!